(3) Junaid and his friends were first pushed, then abused as “dirty Muslims”, then told to vacate their seats, their distinctive skull caps thrown on the ground. They tried to escape but Junaid was held down while his assailant stabbed him multiple times. The other boys, who were merely beaten or stabbed, were the lucky ones. They escaped with their lives. B. According to the International Federation of Journalists (IFJ), Pakistan and India are among the world’s ten most dangerous countries in which to work as a journalist. C. This is a matter of shame for both countries. Impunity is becoming a dangerous way of unannounced censorship in South Asia. Impunity will generate more corruption in our countries. D. Journalist Gauri Lankesh was very much aware that her days were numbered but she never named her killers. She knew her enemies did not belong to a particular group or party but to a mindset and ideology. E. Just read her article published in ‘The Wire’ in May 2017. She pointed out that “Karnataka has a long history of attacks on the freedom of press”. She criticized several Congress, BJP and Janata Dal MLAs who had joined hands to suppress media freedom. F. She fought against the double standards of the powerful ruling elite. She never spared her own community. She wrote, “with the number of Kannada news channels increasing, things are becoming murkier…They are just as aggressive in shouting down participants with a different point of view, even more patriotic than self-proclaimed nationalist(s) and are prone to exaggeration while breaking news every minute of the day”. 1. Her brutal murder on September 5, 2017 in Bangalore has sounded an alarm bell for journalists all over the globe, that journalism is becoming a most dangerous profession — that too in the world’s largest democracy. 2. I never knew her personally. Some of my colleagues and friends asked me, ‘Who killed her?’ The question reminded me of the last editorial of the late Sri Lankan journalist Lasantha Wickrematunge who was assassinated in Colombo in 2009. He was the editor of the ‘Sunday Leader ‘newspaper and a thorn in the flesh of then Sri Lankan President Mahinda Rajapakse, who was furious over his criticism of the human rights violations committed by Sri Lankan security forces against Tamil civilians in the war against the LTTE. 3. Lasantha was threatened many times but he refused to accept dictation from the powerful establishment. Some pro-establishment colleagues sometimes called him a “traitor”. That’s when he wrote the editorial which said that “when finally I am killed, it will be the government that kills me”. 4. This editorial was published after his murder. Eight years have passed. Mahinda Rajapakse is no more President of Sri Lanka but Wickrematunge’s family is still waiting for justice. 5. The same was the case of Russian journalist and human rights activist Anna Politkovskaya. The Russians weren’t happy with her reporting from Chechnya. I met her in Chechnya in 2004 when I was detained by the Russian Army and she tried to help me. She was shot near her home in Moscow in 2006. She received four bullets. It was not a secret that Anna Politkovskaya was a prime target of the Russian establishment. President Vladimir Putin was hauled over the coals for some time over her death, but nothing happened to him. Three suspects were arrested but later acquitted by the courts. 6. I also named three people as my possible killers only a few days before an attempt was made on my life in Karachi in 2014. I received six bullets in my shoulder, stomach and legs. The seventh bullet grazed my lower back. Two bullets remain in my body. An Inquiry Commission was set up to investigate the assassination attempt. I was told not to appear before the commission but I decided to speak my mind. I believed it was my right to do so. 7. So I recorded my statement in front of three Supreme Court judges, not once but twice and produced the best available evidence. Instead of providing me justice the democratically elected government of Nawaz Sharif filed a treason reference against my TV channel, Geo News, because Geo pointed an accusatory finger towards powerful elements within Pakistani establishment, including the ISI. 8. Gauri Lankesh received three bullets in her body and died. I got seven bullets, but survived. I know I’m really lucky to be alive. Gauri’s terrible death made me search for other similarities — perhaps, I want her friends and family, my readers, anyone, someone, to know that I understand the pain and the grief and the anger, all twisted into one emotion, that follows when Death comes calling. 9. Gauri Lankesh’s father was a journalist. My father was a columnist and a teacher of journalism in Punjab University, Lahore. She was declared anti-establishment, by her establishment, and a traitor. I also faced the same allegations. 10. I can’t claim that democracy and media is very strong in Pakistan but Gauri Lankesh lived and worked and was a citizen of the biggest democracy of the world. So what happened? How did “they” dare target her? Don’t “they” care what Gauri’s colleagues and friends in the world’s largest democracy will say? Aren’t “they” worried that “they” will be exposed? And what about the collective democratic conscience and pride of the Indian media? How do they deal with this direct challenge to their credibility? 11. I Just read her article published in ‘The Wire’ in May 2017. She pointed out that “Karnataka has a long history of attacks on the freedom of press”. She criticized several Congress, BJP and Janata Dal MLAs who had joined hands to suppress media freedom. 12. She fought against the double standards of the powerful ruling elite. She never spared her own community. She wrote, “with the number of Kannada news channels increasing, things are becoming murkier…They are just as aggressive in shouting down participants with a different point of view, even more patriotic than self-proclaimed nationalist(s) and are prone to exaggeration while breaking news every minute of the day”. (i) According to noted Kannada writer K.Marulisdappa, who knew Gauri Lankesh from her childhood “she was taking a bold stand against the Sangh Parivar here”. 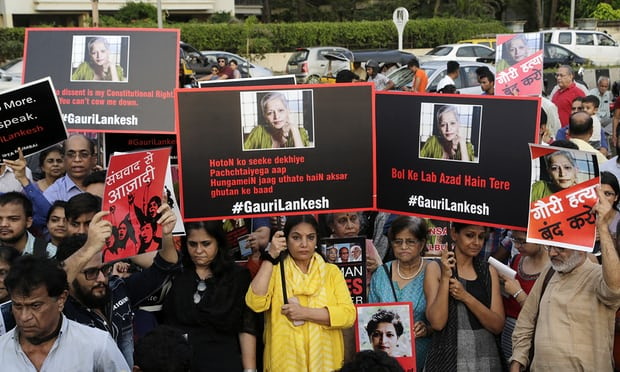 He added that “the same people who killed Dabholkar, Pansare and Kalburgi have nowkilled Gauri Lankesh.” It is also important to note that Gauri Lankesh was held guilty of defamation in 2016 for an article she wrote in 2008 about the alleged corruption of two BJP leaders. (ii) Karnataka’s chief minister Siddaramaiah condemned Lankesh’s murder as “an assassination of democracy”, but continues to face a hatred campaign on social media even after losing her life. (iii) Some people tried to link her death with that of Kashmiri militant Burhan Wani. Ashish Singh, who is followed by prime minister Narendra Modi on Twitter, tweeted, “After Burhan Wani, Gauri Lankesh also killed, how sad”. 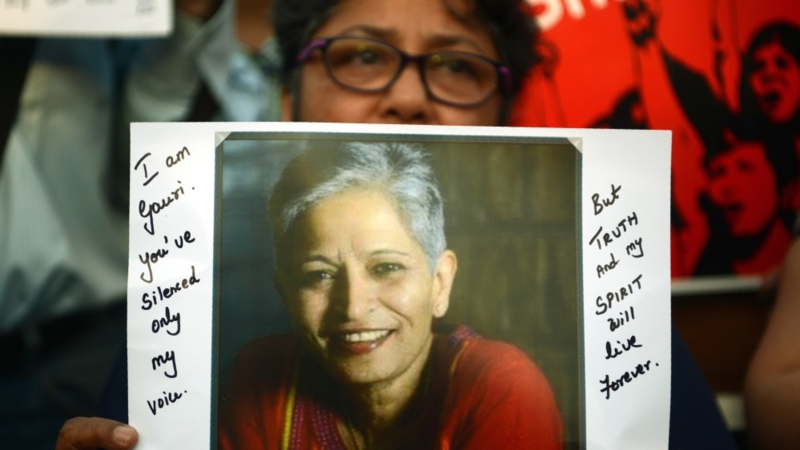 (iv) Gauri Lankesh’s brutal death is a sad day in the life of the Indian media as well as the media across South Asia. I, a Pakistani journalist, am deeply saddened and angry about the ultimate sacrifice that a fellow journalist from India has paid. She was fighting against religious extremism as we are. This ideology is a common enemy of journalists all over the world. (v) According to the International Federation of Journalists (IFJ), Pakistan and India are among the world’s ten most dangerous countries in which to work as a journalist. (vi) This is a matter of shame for both countries. Impunity is becoming a dangerous way of unannounced censorship in South Asia. Impunity will generate more corruption in our countries. (vii) If we want to get rid of corruption and extremism we have to support all those journalists who raise their voices against these evils. That is why the killers of Gauri Lankesh need to be exposed. When they are, no establishment in any part of the world will dare kill journalists like Wickrematunge and Politkovskaya who named their killers when they were alive. (viii) Gauri’s last writings and tweets tell us, “I know who is behind my death.” Whether or not her killers are convicted, it is our collective responsibility to find them and name and shame them. (ix) Stop this culture of impunity against the media. Salute Gauri Lankesh. Hamid Mir is one of Pakistan’s best known journalists and anchors a programme on Geo News called ‘Capital Talk.’ He tweets @HamidMirPak” Courtesy by: THE INDIAN EXPRESSS. 13. The dharma of a journalist is to ask difficult questions, hold the establishment to account and stand up for the dispossessed and the voiceless. Gauri Lankesh was acutely conscious of that. Throughout her journalistic career, she stood up for those values, fighting not just corruption but also bigotry and the purveyors of communal hatred. She was threatened, sued and finally, when she refused to be silenced, killed in cold blood. 14. The identity of her killers is not known, but her brutal murder by gunmen who shot her outside her home must be seen in the backdrop of the rising violence against dissenters and rationalists and those who have consistently spoken out against the forces of sectarianism and hatred. A climate of intolerance has built up, fuelled by politicians and sundry extremist organisations who operate in the name of religion; sadly, sections of the big media have played a dangerously complicit role in fostering this climate. 15. Over the past four years, leading thinkers Narendra Dhabolkar, Govind Pansare and M.M. Kalburgi were gunned down for raising their voices against communalism and superstition. The role of militant Hindutva organisations is suspected but the police in Maharastra and Karnataka do not appear to be treating these cases with any sense of urgency. The modus operandi of the killers in Lankesh’s murder appear similar. A proper investigation will be required to pinpoint who killed her – and more importantly who got her killed – but it is impossible to ignore the context. 16. Just about a year ago, she was sentenced to six months in jail after being convicted of defamation in cases filed by two BJP leaders in Karnataka. Though she was released on bail, the sentence was hanging over her head. The conviction prompted no less a person that the BJP’s IT cell to publicly issue a veiled warning to journalists at large. 17. Journalists in India have long valued their independence, but of late, that one-time feistiness has morphed into a coziness with the powers that be. Some journalists are blatant about their support for the government, others, while pretending neutrality and equidistance, are more subtle. Either way, the space for independent journalism – which does its job without fear or favour and seeks to serve only the reader/viewer – is rapidly shrinking. How dangerous the profession is can be gauged from the fact that five journalists were killed in India in 2016; the same year, India dropped three places to 136 in the global Freedom of the Press index. 18. A brazen killing such as this one seeks to send out a chilling message to not just journalists but to all independent thinkers and dissenters – that this could be their fate too. The only proper response should be to do the exact opposite of what the killers want – to continue standing up to those who are out to spread terror and silence all opposition. Intolerance of this kind has to be resisted and exposed. Gauri Lankesh would have done that and we owe it to her to continue the fine tradition. 19. Our response should not be to desist from speaking one’s mind but the exact opposite – Gauri Lankesh would have done that and we owe it to her to continue the fine tradition. THE WIRE: BY EDITORIAL ON 06/09/2017. 20. The dharma of a journalist is to ask difficult questions, hold the establishment to account and stand up for the dispossessed and the voiceless. Gauri Lankesh was acutely conscious of that. Throughout her journalistic career, she stood up for those values, fighting not just corruption but also bigotry and the purveyors of communal hatred. She was threatened, sued and finally, when she refused to be silenced, killed in cold blood. 21. The identity of her killers is not known, but her brutal murder by gunmen who shot her outside her home must be seen in the backdrop of the rising violence against dissenters and rationalists and those who have consistently spoken out against the forces of sectarianism and hatred. A climate of intolerance has built up, fuelled by politicians and sundry extremist organisations who operate in the name of religion; sadly, sections of the big media have played a dangerously complicit role in fostering this climate. 22. Over the past four years, leading thinkers Narendra Dhabolkar, Govind Pansare and M.M. Kalburgi were gunned down for raising their voices against communalism and superstition. The role of militant Hindutva organisations is suspected but the police in Maharastra and Karnataka do not appear to be treating these cases with any sense of urgency. The modus operandi of the killers in Lankesh’s murder appear similar. A proper investigation will be required to pinpoint who killed her – and more importantly who got her killed – but it is impossible to ignore the context. 23. Just about a year ago, she was sentenced to six months in jail after being convicted of defamation in cases filed by two BJP leaders in Karnataka. Though she was released on bail, the sentence was hanging over her head. The conviction prompted no less a person that the BJP’s IT cell to publicly issue a veiled warning to journalists at large. 24. Journalists in India have long valued their independence, but of late, that one-time feistiness has morphed into a coziness with the powers that be. Some journalists are blatant about their support for the government, others, while pretending neutrality and equidistance, are more subtle. Either way, the space for independent journalism – which does its job without fear or favour and seeks to serve only the reader/viewer – is rapidly shrinking. How dangerous the profession is can be gauged from the fact that five journalists were killed in India in 2016; the same year, India dropped three places to 136 in the global Freedom of the Press index. 25. A brazen killing such as this one seeks to send out a chilling message to not just journalists but to all independent thinkers and dissenters – that this could be their fate too. The only proper response should be to do the exact opposite of what the killers want – to continue standing up to those who are out to spread terror and silence all opposition. Intolerance of this kind has to be resisted and exposed. Gauri Lankesh would have done that and we owe it to her to continue the fine tradition. 26. Gauri Lankesh raged against the world. A world of injustice, inequality, squalor, discrimination, violence, plunder, and greed. Gauri had a dream. That there could be an end to such injustice in our times. Both the rage and the dream were part of the weekly, Gauri Lankesh Patrike, that she brought out, against all odds, including, as her death proves, threats to her person”. Courtesy by: The Indian Express. 28. "Gauri Lankesh was a known critic of the central government on key issues and had fearlessly expressed her views in the newspaper she edited, as well as in other forums," the Editors Guild of India said in a statement. 29. "Her killing is an ominous portent for dissent in democracy and a brutal assault on the freedom of the press." 31. Its anti-establishment views struck a chord with many readers, but also drew the ire of right-wing political forces, including the Bharatiya Janata Party (BJP), which runs the federal government. 32. A Special Investigating Team was tasked with probing Lankesh's murder, which came more than two years after the killing of rationalist MM Kalburgi, a former vice chancellor of Hampi University, in a similar attack. The investigation into his death has still not been concluded. 33. "There have been attacks on writers and thinkers in the recent past, particularly since the ascendancy of Mr [Prime Minister Narendra] Modi. There has been murder of rationalist [Narendra] Dabholkar in Pune, [Govind] Pansare, a left party worker in south Maharashtra [state], Dr Kalburgi in Karnataka's Dharwad, where I currently live," Ganesh Devy, a prominent linguist and a novelist, told Al Jazeera by phone. 37. Once quiet, civilised Bangalore is shaken to the core by the news of the shocking murder of its most famous journalist, Gauri Lankesh. In big cities and small towns across India thousands of people are protesting at the murder of a gutsy woman who fought for the marginalised, who called Dalit victims her sons, and who protested against injustice and venal politics in the face of death threats. 36. When you know someone, their death hits you harder. Lankesh was the recipient of endless hate mail from Hindu extremists. She was vilified on two fronts. She dared to take on the powerful Bharatiya Janata party (BJP), currently ruling most of India. She criticised them and their cohorts for attacking minorities and creating a culture that enabled lynching, mob violence and hate crimes. She also defended Dalit rights, provoking the ire of many dominant-caste Indians across the political spectrum. 39. Harsh Mander, former civil servant and activist writer, has appealed to the majority of peace-loving Hindus of India to stop the violence, to stand with the minorities. Even as Lankesh was being lethally mown down, a peace pilgrimage, or yatra, had been initiated in faraway Assam. Called the caravan of love, Karwan e Mohabbat (Kem), it aims to atone for the violence against minorities, and beg for peace and harmony to replace the politics of hate. Currently Muslims, tribal groups (the Adivasi), Dalits and Christians have been singled out in violent attacks. 41. Kem proposes to travel across India, to meet the families of people victimised, attacked, raped and murdered for being minorities. It began on 4 September, 2017 when Mander and other activist writers visited two women whose teenage sons had been brutally killed. 42. The cousins, Riyaz and Abu, had gone fishing on their day off. Someone screamed that they were cattle thieves. Within minutes a mob assembled. The boys were thrashed mercilessly while pleading for their lives. Their mutilated bodies came home with eyes gouged out and ears cut off. Two carefree, laughing boys left home promising their mums a fish feast. Instead the women received the worst news possible for any parent: their children had been murdered. 43. Kem urges Indians to fight to uphold the values of the Indian constitution, which promises its citizens liberty, justice, equality and fraternity after centuries of oppression. Now we appear to be turning into that which we hated, that which we fought against: oppressors, cruel tyrants, intolerant murderers. 44. In the last two decades, the voices of Hindu extremists have become more vocal, frighteningly shrill. They’ve become emboldened with the culture of impunity which seems all-pervasive. When minorities are killed, often falsely accused of trading, eating or carrying beef, by cow vigilantes, our most vocal, always tweeting Prime Minister Modi says not a word. The silence is deafening. This has encouraged the fanatics to lynch, attack and kill people. 45. Shockingly, the fanatics glorify Nathuram Godse, the man who assassinated Gandhi, because he believed Gandhi had caved in to Muslim demands by allowing the creation of Pakistan. The once-banned Godse cult is now thriving. Social media are powerfully used to propagate lies, hate and distorted facts. 46. Critics of Hindu nationalists’ fanaticism are being murdered to scare all dissenters into silence. Two years before Lankesh’s death, the eminent intellectual MM Kalburgi was also shot dead outside his home. That same year, Govind Pansare another vocal critic of extremist Hindu groups, was murdered. In August 2013, the Dalit campaigner and atheist Narendra Dabholkar killed. All of these martyred Hindus were fighting for the idea of India. They were battling to save Hinduism from bigots and charlatans. 47. Never has India witnessed the flood of hatred and vitriol currently being so openly spewed. 49. Mander issued a challenge to India, but especially to the Hindu majority. “It’s a call of conscience to India’s majority,” he says. “We need our conscience to ache. We need it to be burdened intolerably.” Silence can mean complicity. The silent majority needs to speak up. And to speak out now. Otherwise the Hindu stalwarts who fought for justice will have been martyred for nothing. 50. In spite of these dark, dismal days, hope has not died. People are protesting: “Not in my name.” And India’s supreme court has just ordered all states and union territories to appoint police officers in every district to track down and prosecute cow vigilante groups. Perhaps sanity will be restored. Perhaps peace will return to this beleaguered nation again. Perhaps Lankesh and the martyrs who preceded her will not have died in vain.